What's With the Green Screen? See examples of how to enhance the videos with the green background. This module provides clips of people speaking from the space station and being interviewed on Earth. You can download clips of space station experts as they share their knowledge about the orbiting laboratory. Camille Alleyne is an assistant program scientist for the International Space Station. She discusses the work being done on the station. 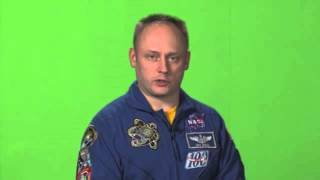 Mike Fincke is an astronaut who has spent a total of more than 381 days in space. He shares his expertise about life on board the station. The On the Space Station clips include a tour of the International Space Station and a view of what life aboard is like. Click "Playlist" at the top of the video player to view and select from available videos. In the list below the video player, right click (use CTRL + click for Macs) to download the video or the audio. (Alleyne) My name is Camille Wardrop Alleyne. I work here at NASA Johnson Space Center, and I am the assistant program scientist for the International Space Station. That means that I am responsible for all communications to the public, to our stakeholders, to Congress, to our leaders in Washington, D.C. And I'm responsible for all the education portfolio of the International Space Station, including the international education projects. Download Audio (Alleyne) The International Space Station is a world-class scientific laboratory, where we perform experiments and investigations in a microgravity environment, or an environment in space where gravity has no effect. It is operated by six crew. We have a full crew complement of six, and it's operated around the clock -- 24/7. Why a Lab in Space? (Alleyne) It's important to have a laboratory in space because, one, science is about understanding the natural world around us. And we really want to understand nature without all the effects of gravity. And we know that gravity is a force of attraction in the universe that affects everything -- all our biological, chemical and physical processes. So it's really important for us to understand nature without that effect of gravity. (Alleyne) We have over 110 experiments going on right now on the space station. We do everything from flying microbial bacteria in space to learn how vaccines can be developed. We study plants and crystals and how they grow. We do extensive experiments and assessments on the human physiology, or the human body, trying to learn about the effects of microgravity on the human body and what the countermeasures (are) that could be developed for the human body to adapt better to the space environment. We have major external instruments on the space station that study the Earth and study space. And, of course, we use the International Space Station as an education platform and an education resource to motivate and inspire kids to love and study science, math, technology and engineering. (Alleyne) There are our partners who specifically focus their design, their own experiments, and they are solely responsible for the results and investigations of those experiments. But we have had collaboration of investigations. One of our most exciting new payloads that we have added to the International Space Station (is) called Alpha Magnetic Spectrometer, which is a particle physics detector that we're using to study the universe and to understand the origins of the universe. That's a collaboration of over 60 institutes from 16 different nations around the world. We've had Japanese and Russian experimenters, or investigators, who have worked together on protein crystal growth experiments. And one of our education payloads, called SPHERES, which is when students program little mini-satellites and they design the algorithms to control those satellites, started out with a collaboration between NASA and MIT (Massachusetts Institute of Technology), and now is extending that partnership to the European Space Agency. So, we have many investigations that are managed by a collaborative team across nations. (Alleyne) Astronauts get drinking water from a system that recycles water that's found in the air of the space station, from the urine of the astronauts, and from urine flush water. That's all recycled and filtered through our Environmental Control Life Support System and an assembly called a water processor assembly that filters and recycles all that into potable drinking water. (Alleyne) The ECLSS stands for Environmental Control Life Support System, and it is the system that provides a living environment for the astronauts on board the International Space Station. It provides oxygen; it removes carbon dioxide; it recycles the water, as I said, or recycles their waste -- the liquid waste -- into potable drinking water. It also consists of the waste management system. So, it really provides a living environment for which the astronauts can live on board the space station. (Alleyne) We have vaccine experiments that are looking at developing -- looking at how bacteria or viruses adapt to the environment of space. And from that, you could determine how the makeup of those bacteria behave. And investigators or scientists could then develop vaccines for those particular bacteria that cause infections on the ground. We also have protein crystal growth experiments going on. We study materials and how materials being exposed to the environment of space (adapt or behave). We have earth science experiments, where we have instruments that study our Earth, coastal region degradation, or the environment, our atmosphere and how that changes over time. We have crew Earth observation, which is an opportunity for the crew to take images of our Earth and dynamic events, such as hurricanes. We just had a hurricane a few days ago, and we had spectacular images taken by the crew on board the International Space Station. It's used as a tool to communicate these type of events, like volcanoes or fires, that are happening around the world. We have space science experiments -- the Alpha Magnetic Spectrometer -- that (are) able to detect particles from the cosmos so that we can learn what the makeup of the universe is and what the origins of the universe (are). We have, of course, education programs such as ARISS, which is Amateur Radio on ISS, where students from all over the world can connect and talk to astronauts on board the space station via ham radio technology. We have an education project called EarthKam for middle school students, where they're able to program the camera on board the International Space Station to take images of the Earth that they then download into their classroom, and they could use as a part of their earth science or geography or social studies classes. So we have a litany of experiments, exciting investigations going on on the International Space Station. (Alleyne) Science is about understanding the natural world around us -- how cells behave, how our bodies behave. We know when we study it on Earth, it's all affected by gravity. When we take gravity out of that equation, what happens? And so that's why we study these different things. So microbial bacteria in space we have seen behaves differently than it does on the ground. It behaves differently when there's no gravity. We have seen, in the past, that it becomes more virulent or its potency to carry diseases increases. So that is something we never saw on Earth studying microbial bacteria. And that allows scientists on the ground to develop different vaccines for the extreme cases of when they are more virulent, or more potent, so that we can combat these infections and illnesses on the ground, on Earth. Does the U.S. Pay for the Space Station? Download Audio (Alleyne) The United States was mainly responsible for assembly, delivery and construction, and now operation, of the space station. We have nations who pay us to utilize the space station and who have provided different elements to the space station, but the United States doesn't necessarily pay for the space station. Who Operates the Space Station? (Alleyne) Russia has control and operation of at least about 50 percent of the International Space Station. The other 50 percent -- we call the United States Operating Segment -- is divided up by the other nations: the U.S., Japan, Canada and Europe. NASA has 76.6 percent of utilization, crew time utilization of the space station. Japan has about 12.3 percent; Europe has 8.3 percent; and Canada has about two or three percent of crew time utilization of the space station. (Alleyne) We have had some amazing results, and keep in mind that we just completed construction of the International Space Station in the year 2010 of the 10 years of assembly. And so, if you think of a science laboratory on the Earth being constructed, you don't have access to do experiments on that lab until it's complete. We had the good fortune of being able to do investigations (limited) -- since the first element of the space station was launched back in 1998. Since then, we have had some amazing accomplishments that we've been able to share with the public. One is vaccine development. A few years ago salmonella was flown, and we know salmonella causes food poisoning in human beings across the world. The salmonella bacteria was flown, and because of the microgravity environment, we were able to see how that bacteria behaved in microgravity. It became more potent. And as a result, companies on the ground -- one company in particular -- has been able to develop a vaccine that is in the review cycle with the federal (Food and) Drug Administration for that salmonella illness. We have protein crystal growth experiments that are being used in the treatment for something called Duchenne's muscular dystrophy, which is a debilitating disease that affects boys, age around 7. One in 3,000 boys are affected. And so, as a result of this protein crystal growth experiment and investigation, it's being used as a candidate treatment for this type of disease. We've also had cancer treatment delivery improvements on type of methods that are used for delivering cancer drugs to infected cancerous cells. It's called microencapsulation. And as a result of spaceflight and that experiment being flown on the International Space Station, improvements have been made on that process, and trials -- clinical trials -- are being started at our pre-eminent cancer centers in the United States using that improved drug delivery technique for cancer. So those are just a few of the results that we've had so far on the International Space Station. (Alleyne) One of the big things that we do is assessing how the human body adapts to spaceflight and long-duration spaceflight. So we have a lot of human research being done on the International Space Station -- really learning how our human bodies adapt. We know that there's bone density loss. We know that there's muscle atrophy. We know that there's immune system suppression, so (we are) really trying to understand how the human body adapts to long-duration spaceflight in hope of one day sending humans beyond Earth to other planets. It really helps us to understand that, and that's one of the most important things we do on the International Space Station. (Fincke) Hello. I'm Colonel Mike Fincke from the United States Air Force. I work at NASA, the National Aeronautics and Space Administration. I flew as a mission specialist aboard the space shuttle, as well as served two tours aboard the International Space Station. My most recent tour was commander of Expedition 18. (Fincke) The International Space Station is the largest space structure ever built by human beings. Of course, it's not as big as the fictional Death Star from "Star Wars" or a really big starship like starship Enterprise, but (the) space station is real and we built it -- not just the United States of America, but the U.S. along with our international partners Canada, Russia, Japan and members of the European Space Agency, such as Germany, France, Italy. And we worked together; we built these different modules. We connected them together in space like a bunch of Tinkertoys or LEGOs, and now we have the world's largest space structure. It's a fantastic scientific laboratory to bring new science back here to planet Earth, as well as to test new engineering things such as water purification and energy production -- things that we need to know as we go out and explore the rest of the cosmos. (Fincke) We have an incredible, vast array of scientific experiments currently aboard the International Space Station -- experiments that astronauts don’t even see or very much even know about on the outside of the space station, which are managed and run by people here on planet Earth, to experiments that are very important to us because we have to do them to ourselves such as take our own blood or collect other biological samples. And so there is everything in between, and that's what's really neat about being a scientist aboard the International Space Station. Every day is something new. One of my favorite experiments is called SPICE. It had nothing to do with eating but had to do with fire and flames. The better we understand combustion without gravity means the better we understand combustion, period. The better we understand combustion, period, means the better fuel efficiency we have for our cars here on planet Earth and the better rocket engines we can build. (Fincke) Although no two days aboard the International Space Station are the same, we still have a kind of a typical day. We run on Greenwich Mean Time. That means the universal coordinated time and what time zone it is in London, England, along the Greenwich meridian. So that means (for folk here in the United States) it’s four or five hours earlier than it is here in the U.S., and it’s three or four hours later than it is in Russia, for example. We start up in the morning; we get up at about 6:30 or 7. We have a chance to brush our teeth and wash our face, get a little bit of breakfast. We kind of read the day's plan. Then we start out by talking to all the control centers across the planet to get our daily plan coordinated, and then we go off and execute our plan. So some days, it’s getting ready for a spacewalk; other days, it's science; other days, it's maintenance. Every day it's something new, but we never forget to stop for lunch. In the middle of the day, we stop for lunch, regroup as a crew, make sure we're well fed, and then we move on to the next thing that we have during the day. Each day, it doesn’t matter -- sometimes it's in the morning, sometimes it's in the afternoon -- but we do take time to exercise. Exercise aboard the International Space Station is important so that we don’t lose so much bone or muscle. We have some really neat exercise machines aboard the space station. And then when it gets to the evening time, we close off the day by talking to all of our friends in the control centers across the planet, make sure that we have answered any questions that they have about what we did during the day. Then, we get a small break: We eat a little bit of dinner; we look out the window; we talk to our family and friends -- either by email or by phone calls -- and we call it a day and get ready to do the same thing the next day. It's a lot of fun. (Fincke) The work schedule is planned each and every day, not by the crew on board but by our team on the ground. Our planning team has a big picture from weeks or even months in advance of things that need to be accomplished, and then they give us the daily plan the night before or even, sometimes, the morning of the day that we get to do it. So we don't always know what's coming in front of us, but we always know that it's something that we can do, and if we have questions or suggestions, we can always call back down. But by having the ground team to plan our days, (it) is really convenient for us because we don't always know the big picture on the status of a lot of things; whereas, the ground has a much bigger team than just the six of us aboard the space station. So they come up with a great plan; we make our modifications; and then we go out and do it and enjoy it. (Fincke) Communications aboard the International Space Station are very important. Whether it starts with just being able to communicate among the crew -- we use English as our main language, but Russian is also a very common language aboard the International Space Station -- to communicating with the ground. We have special high-capacity data streams talking through satellites, to talk to the ground, so we can almost talk to the ground 24/7 -- almost continuous coverage. We can also talk to our families through a voice over IP, an Internet phone, kind of like a lot of you guys have at home on your computer. We just have a headset on board, and we can call our families but only when we have certain kind of satellite coverage. So it's not perfect, but we definitely get a chance to talk to our families and friends while we're up aboard the space station. We also have a local area network -- a LAN on board -- in a series of laptops, and we do have Wi-Fi. And then only just recently did we get the ability to use the Internet aboard the space station. Of course, we've always had email. But actually being able to surf the net has just come on board lately, and we're working on some of the bugs. It's kind of slow right now, but, hey, we do have Internet. (Fincke) As astronauts, you might think we are like super people, and that we never need to eat, or we never need to go to the bathroom, or we never need to shower -- but, actually, all human beings are pretty much the same. So aboard the space station -- it's just like on planet Earth -- you have to eat, and you have to have good nutrition. The folks on the ground are both in the United States and Russia and, nowadays, a little bit from Japan. They prepare our meals months in advance and then send them up to us. We really don't have too much refrigeration or freezing. So all of our meals are kind of either need to be rehydrated or they're kind of like meals ready to eat, MREs, which most of you guys know about these days. So the food is there, and it doesn’t take too much time to prepare. Of course, after eating, you gotta go to the bathroom sometimes, right? So we have two toilets aboard the International Space Station; they both are very similar -- so interchangeable parts. We do number one, which is pee, we pee into a separate container than we do number two in. We recycle the number one -- the urine, the pee -- and we actually use the water that comes out of that to make oxygen, because you know water is H2O, right? So, we use the O -- the oxygen -- as well as we use that water for scientific experiments and sometimes we even use it to rehydrate our meals. It's very pure. The number two we throw that away with all the other space trash that we have. We exercise two hours every day. Exercise is very important aboard the space station. After exercise, it would be great to take a nice hot shower: nope, no showers aboard the space station. But we do have these wet towels, and we wipe ourselves from head to toe with the towel once or twice every day. We stay pretty clean; it doesn't smell very bad at all. (Fincke) The best thing to do -- the most fun thing I ever did aboard the International Space Station --- was to look out the window. We have the most beautiful planet, planet Earth, and the views never get boring. You can see anything and everything. I remember seeing hurricanes and looking them straight in the eye. I remember seeing the pyramids of Egypt, the Amazon rainforest. Places that I (have) never been to on planet Earth, but I flew over them. It never got old. It was wonderful, and the best thing to do. (Fincke) So, the International Space Station is amazing, and why it's amazing is because 15 countries working together, people that don’t even speak the same language, people that used to be enemies and fought together and against each other in major wars -- World War II, (the) Cold War -- we're now working together and we are now playing with each other nicely. And we're building something incredible. The International Space Station is the largest space structure ever built by human beings. It's already pushing back the frontiers of science. It's going to give us a great engineering platform so that we can jump off to exploring the next phase. Whether we go to the moon, to asteroids, or to Mars, it's going to be because we learned a lot of things, like how to live in space aboard the International Space Station. And I think it’s a great symbol of what human beings can do when we work together, constructively. That’s why the space station's amazing. (Fincke) The space station is a great place to live and work. The most amazing things you can do aboard the space station are to fly around and live in microgravity where liquids don't fall on the floor, or you can't drink carbonated beverages because the bubbles won't go anywhere. I mean it's just a different place. The most amazing thing is to know that your body can adapt to some place that is completely crazy, completely fun, like floating around in space, not just floating but actively flying, and just knowing what you need to do, and flying backwards and upside down and doing a somersault because that is the most efficient way to get from to one point to the next. And then learning all of the science that you can do aboard the space station without gravity affecting the results, so you can see how flames behave or how liquids behave or how the human body adapts by sampling your own blood, or performing some really incredible medical experiments. It's an amazing place to do science -- the International Space Station. (Fincke) The International Space Station seems like it costs a lot of money. It must have because it took so many rockets to get it into space. And it seems like with all the problems that we have here on planet Earth that the space station might be considered, as a little bit, shall we say, fanciful or a trivial way to spend our money. But most people don’t realize that every dollar that we spend to go fly in space comes back to us at least seven times. There've been studies that have shown this. For example, when we went to the moon, we had to learn how to make computers smaller because you can't land a lunar module, the module that landed on the moon, you can't land that with a really big computer -- a room-size computer -- but you need a computer, so they had to shrink them down. Well, shrinking down computers has spawned one of the most important industries for the United States and for the world -- the high-tech industry. Where now everyone has iPhones and iPads and other Android-powered devices and things like that. All this came from the space program. And it's now powering our economy. So most people don't realize that space is not just a really cool place, but it makes life here on planet Earth a heck of a lot better.